Father Thomas Vassalotti hears the confession of one of the participants. 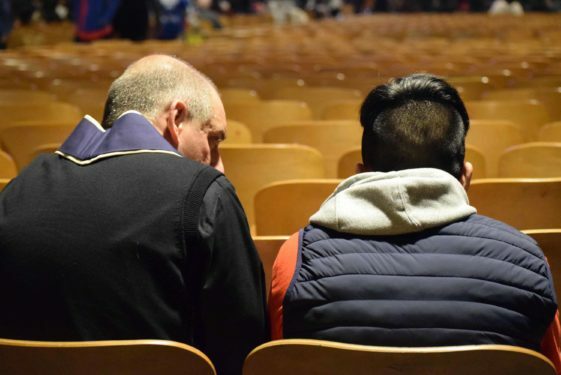 Priests from throughout the diocese heard confession, including Father Patrick Longalong, pastor from Our Lady of Lourdes, Queens Village. 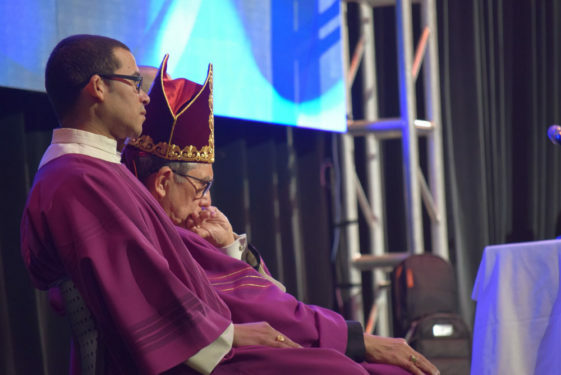 Auxiliary Bishop Octavio Cisneros in thought. 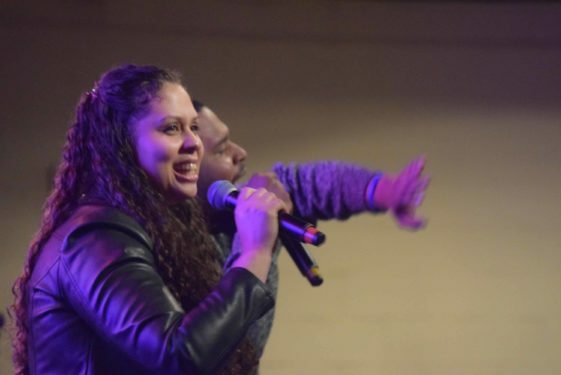 Alveris Sencion leads the lively singing at Brooklyn’s Catholic Youth Day. 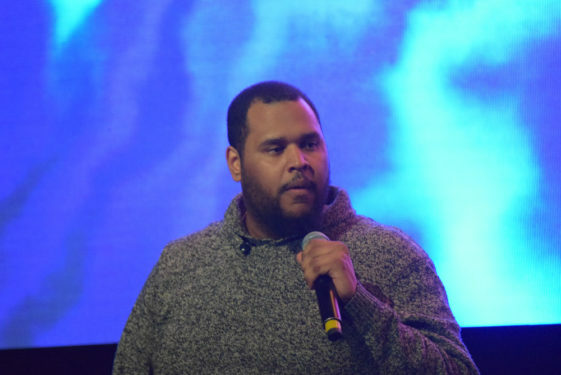 Keynote speaker Stephen Eguino of The Bosco Beats spoke to the youth about encountering their faith through music. Keynote speaker Stephen entertained the crowd with his music skills. 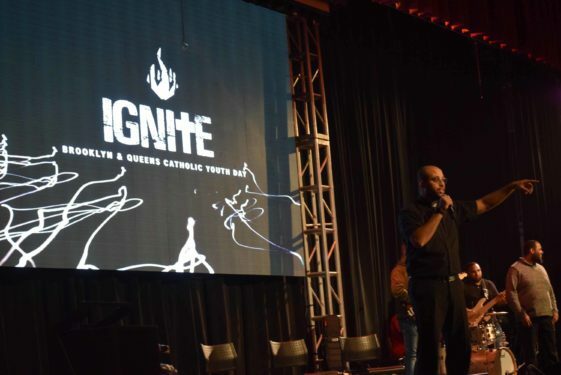 Father Jose Diaz explains the theme”Ignite” to the assembly. The thought-provoking panels were setup barbershop style. Father Jose Diaz emceed the daylong event. The pre-confirmation students attended their youth rally at Holy Name Parish in Prospect Park. St. John's University students led their own panel. 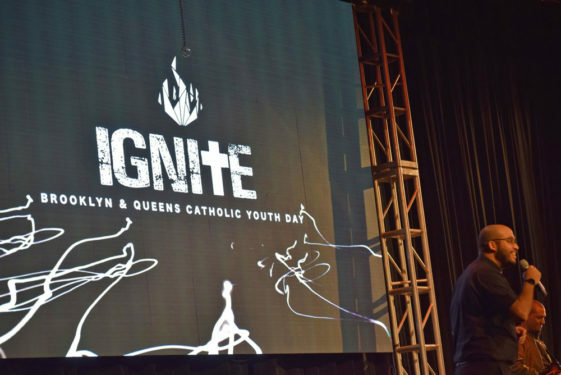 “They’re going to ignite each other in the fire of the spirit,” said Auxilairy Bishop Octavio Cisneros before celebrating Mass at the 2019 Brooklyn Catholic Youth Day (BCYD) on March 30. 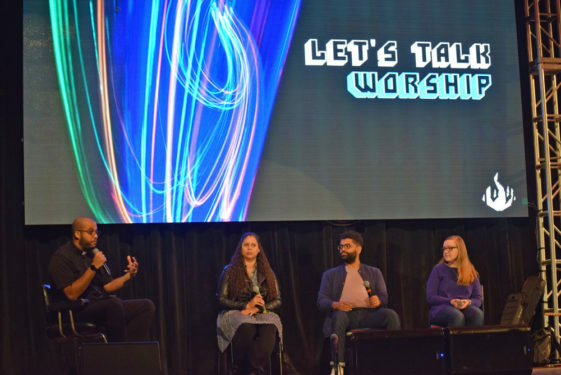 Through the gifts and talents of a live praise and worship band whose members played the drums and keyboard, rocked the guitars and sang their hearts out, hundreds of teens inside the former Bishop Ford H.S. 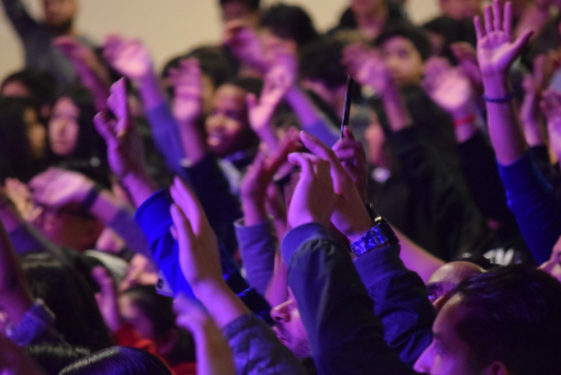 auditorium were enlivened by the sounds of giving thanks to God through song. The lively music struck a chord with high school senior Tiffany Chyke-Okpuzor. 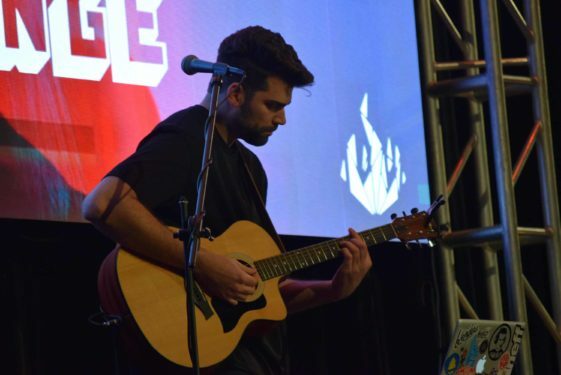 The live music struck a chord with teens who attended the 2019 Brooklyn Catholic Youth Day at the former Bishop Ford H.S, Windsor Terrace. Music was the favorite part for BCYD first-timer Erin Neiswenter, an eighth-grader from St. Francis de Sales parish, Belle Harbor. 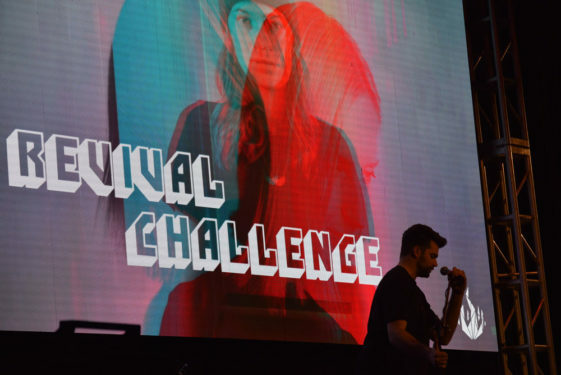 The joy she felt while living her faith out loud is what captured her attention and what ignited a deeper quest for what more God might be calling her to experience. “It really made me want to go to church more, want to pray more and come to more youth groups,” added Neiswenter. 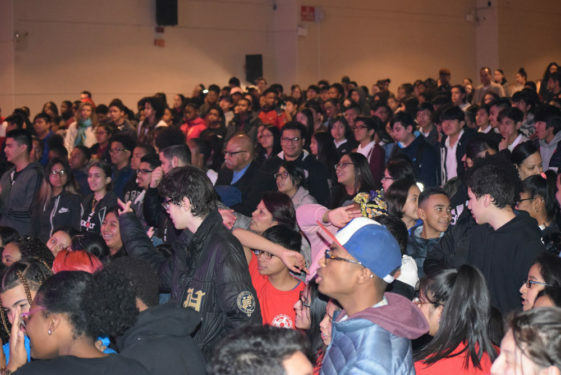 The annual youth rally was held in two locations this year – the former Bishop Ford H.S., Park Slope, and Holy Name parish’s Shepherds Hall, Windsor Terrace. 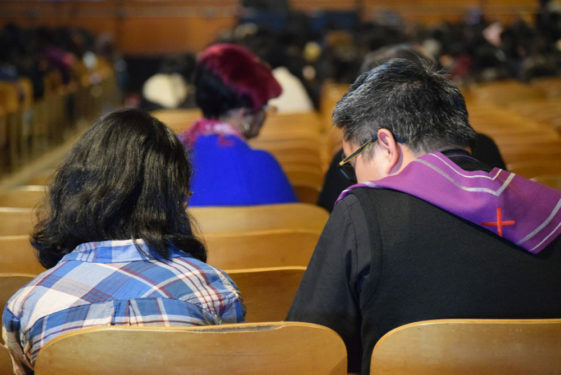 Splitting between the two sites meant that the nearly 300 students from eight different parishes who were preparing for the sacrament of Confirmation would spend most of Saturday learning about topics like the gifts of the Holy Spirit in the parish hall. 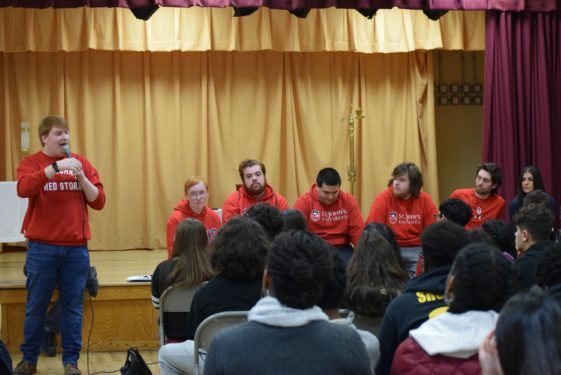 Guiding the youth throughout the day at the Brooklyn church were energetic college students from the Catholic Scholars program at St. John’s University. The keynote speaker for the Confirmation students was national speaker and youth minister Will Smith. 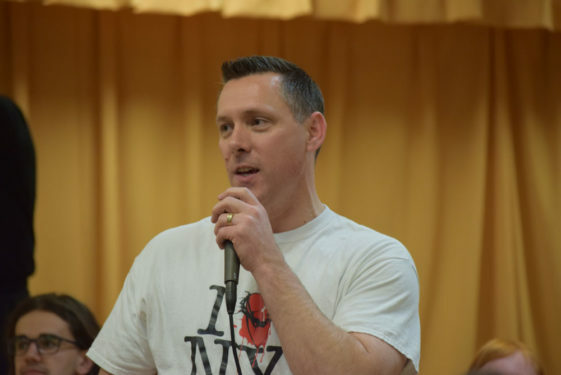 His message about faith and hope was portrayed through the lens of movies and superheroes. He told them that God gave each of them “super powers” or gifts that could be used for the greater glory of God. “Every super hero story is about hope,” he told the youngsters. 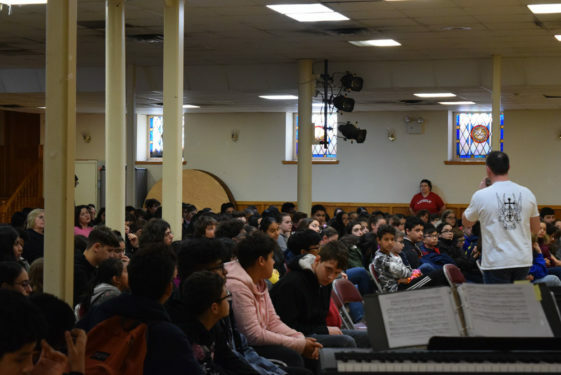 Meanwhile more than 800 students at the former Park Slope high school had a different agenda – engaged through thought-provoking conversations led by the parochial vicar at St. Leo’s, Corona, Father Jose Diaz, who just a year ago at BCYD, was a transitional deacon preparing for his ordination as a priest. 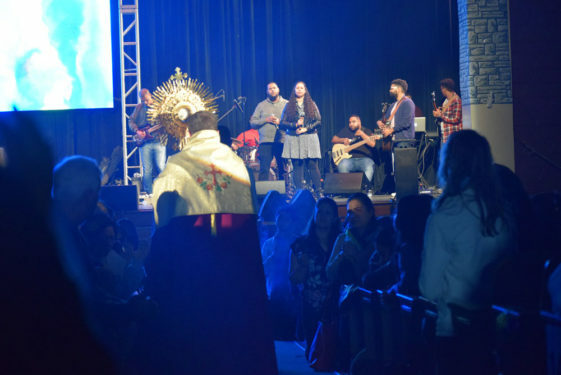 At the 2018 event, hundreds of teens were praying over him and two other transitional deacons who now serve at different parishes in the diocese. 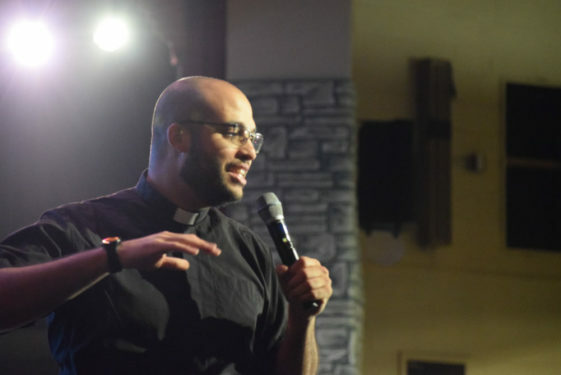 Standing on stage in front of the crowds of teens, the Dominican-American priest born and raised in Queens felt right at home. He easily related to the teens, especially the Spanish-speaking who laughed at his jokes when he spoke about growing up in a Dominican household. 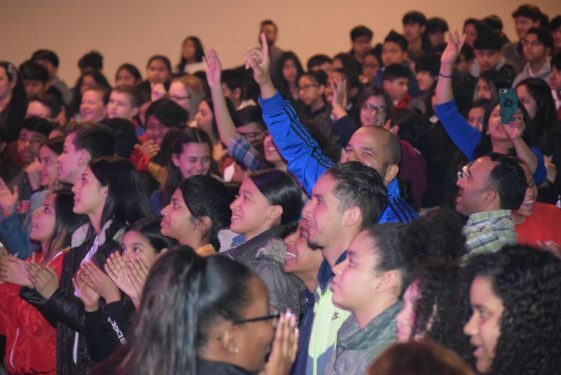 Whether it was relating to Father Diaz’s stories or simply hearing Bishop Cisneros speak about the universal Church in his native tongue, what resonated for some of the teens was hearing the Spanish language spoken by those leading the day-long event. 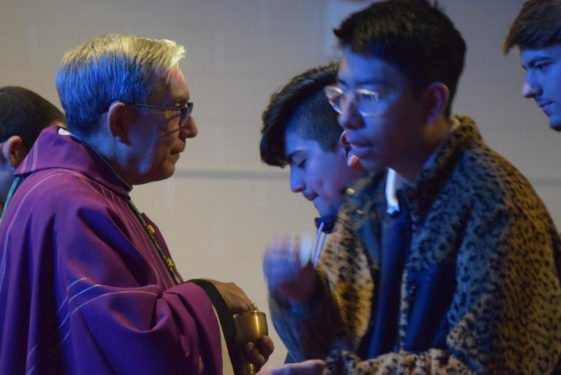 During the closing prayer after Mass, Bishop Cisneros spoke in English and Spanish about the diversity of the many countries that were represented at BCYD. Yet the bishop also said that diversity wasn’t a division in the Church, but what unites the Church as one faith. High school senior Armando Ruiz erupted in praise after the bishop spoke. 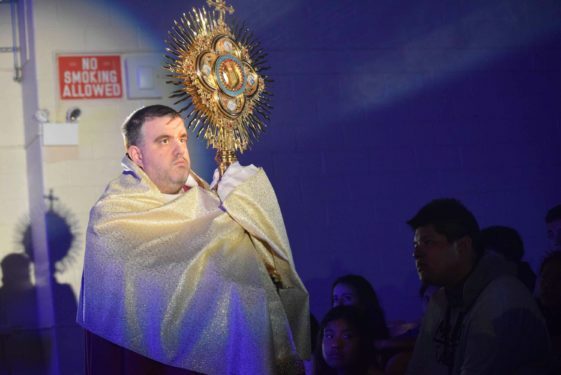 “I saw it in their hearts, in their motions, in everything and then I think the most telling was during Adoration when I saw some of my teens crying before the Lord, that was powerful,” said St. Francis de Sales, Belle Harbor, Youth Minister Kathleen Woods. 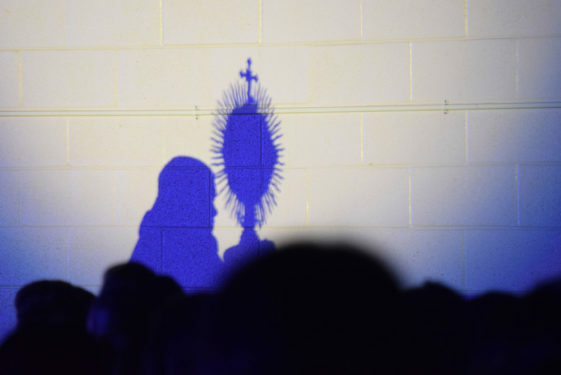 The highlight of the day was when the teens participated in adoration. Father James Kuroly, spiritual director of the Jornada movement, processed around the auditorium carrying the Blessed Sacrament. 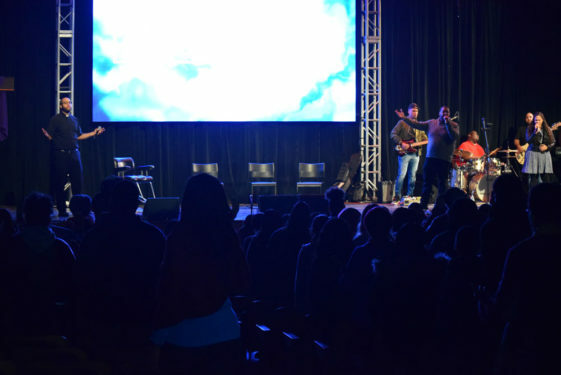 As the praise and worship band accompanied the solemn hour in song, teens expressed their faith through reverence and some even through tears. Kathleen Woods hoped her teens would be ignited in their faith and they were. 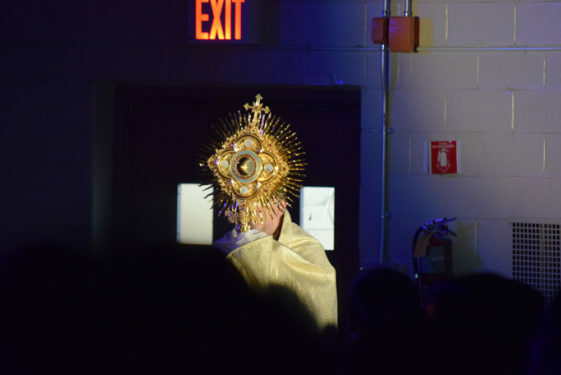 “I saw it in their hearts, in their motions, in everything and then I think the most telling was during Adoration when I saw some of my teens crying before the Lord, that was powerful,” she explained. 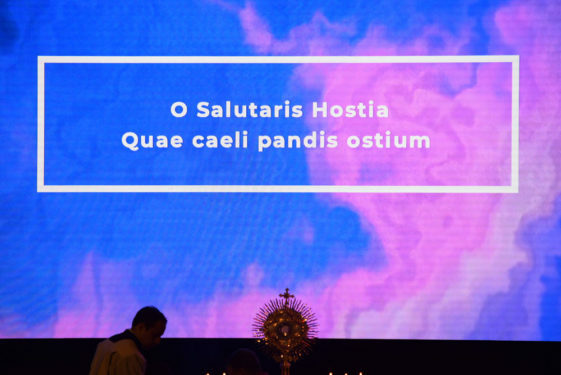 As the day-long event was coming to an end after the exposition of the Eucharist, reverence was replaced with energy as the crowds once again freely enjoyed the live music with the lyrics that were projected onto a large screen on stage.